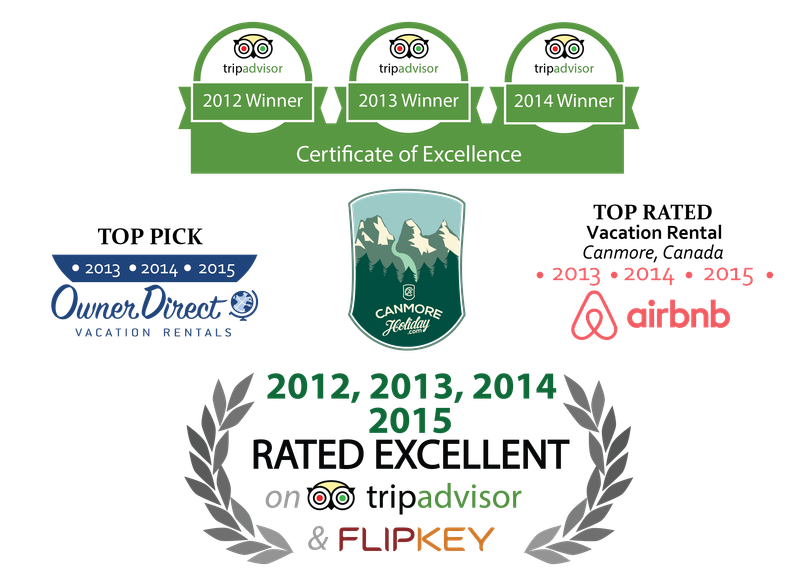 This property is the proud winner of the 2011, 2012 and 2013 Vacation Rental of the Year awards in Canmore by Tripadvisor, and earned Excellence and Top Vacation Rental awards every year since from a number of review sites, including AirBnb, Tripadvisor, Homeaway and more - so you're in good hands! Your short-term mountain getaway is a new condo located in the heart of Canmore one block from Main Street. The central location gives you unlimited access to this quaint town and the natural beauty surrounding it, while offering all the comforts of home...and more! Your two-bedroom condo is located on the second floor of a new condo building. Upon entering, you will note the well-appointed kitchen with stainless appliances, granite countertops and a convenient breakfast bar. Complete with a fridge, stove, dishwasher and microwave, this unit also features a gas bbq on our patio - cook with mountain views! Pots, pans, cooking utensils all included, as are small appliances, such as a coffee maker, toaster, blender and even a clothes iron & board. The unit also has a top-of-the-line washer and dryer with an advanced steam function. Bed and shower linens are provided, as is shampoo, conditioner and soap - just bring your toothbrush! The unit features one queen and one double bed with new, high-end mattresses made from organic cotton. Kick up your feet and enjoy our 42" LCD TV with PVR, Blu-Ray and HD cable, with HD channels and a Blu-Ray library at your disposal. Dedicated wireless internet and local calls are complimentary. Enjoy our beautiful hardwood floors and warm up in front of our stone-surround fireplace: the bedrooms are carpeted for your comfort. Enjoy our iPod, CD, radio and Bluetooth compatible stereo, and rest in comfort knowing your vehicle is toasty warm in our heated underground parking stall (included in the rental) - heated visitor parking is also available, as is plenty of street parking. Ask about our extra storage for bikes or skis. Your Canmore Mountain Getaway awaits!